Students at the U.S. military academies often believe they have to put up with sexist and offensive behavior, a Pentagon report finds, reflecting a culture of disrespect that permeates the schools and their sports teams and fuels reports of sexual harassment and assaults. The report points to scandals involving sports teams at all three academies during the last school year as examples of the problems. It urges leaders to do more to improve training and prevention programs. Set for release Friday, the annual report on sexual assaults at the U.S. Military Academy at West Point in New York, the U.S. Naval Academy in Annapolis, Md., and the Air Force Academy in Colorado Springs, Colo., identifies sports and club teams as an area where they need to expand training. The report was obtained by The Associated Press ahead of its release. Military officials say they are working on ways to encourage students to take action when they see or hear of sexual assault or harassment. Overall, reported sexual assaults at the academies were down, from 80 to 70, during the school year that ended last May. Of those, almost two-thirds were at the Air Force Academy. The report also notes that alcohol is often a factor in sexual assaults, and it urges military leaders to do more to restrict and monitor drinking and liquor sales. Athletes and sports teams came under increased scrutiny in light of separate harassment and assault incidents at all three schools. 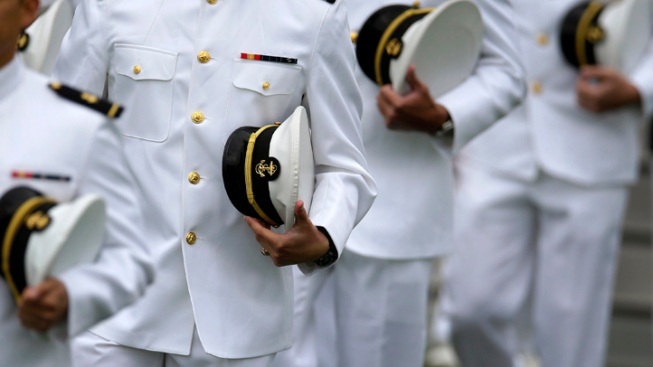 At the Naval Academy, three members of the football team faced accusations in a complicated sexual assault case involving a female student at an off-campus party. Charges were dropped against one team member and may be dropped against another. The third is still scheduled for trial. At West Point, the men's rugby team was temporarily disbanded, and more than a dozen seniors were demoted and faced other punishment and restrictions, after emails that were derogatory to women came to light. And there was a similar problem with sports team members at the Air Force Academy circulating a document that disparaged women. Defense officials said Thursday that students' view crude behavior and harassment as an almost accepted experience at the academies and that victims feel peer pressure not to report incidents. So the schools are being encouraged to beef up training, particularly among student leaders, to recognize and feel empowered to report or step in when they see unacceptable behavior. Both the Army and Navy targeted sports team captains and are using field trips to Gettysburg, Pa., to talk to them about leadership and the need to combat sexual harassment and assault within their ranks. Lt. Gen. Robert Caslen Jr., the superintendent at West Point, said Thursday that the rugby scandal revealed a bad subculture that had existed for years. The challenge, he said, is finding ways to train and encourage cadets to have the moral courage to stand up and report such conduct when they see it. At a meeting with West Point students this week, Caslen said, he talked at length about the rugby team, the punishments that were doled out and what the members learned as the team gets ready to start competing again in the spring. The punishments, he said, not only took away their ability to compete for a time, but also focused on a semester of rehabilitation. At the end of the meeting, he said, classmates applauded team members for going through the extensive rehabilitation, which including community service work, public discussions of what they did and their remorse, and other programs.